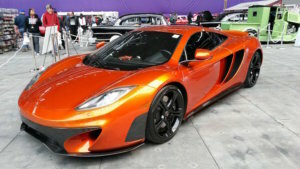 The 51st annual World of Wheels event took place in Minneapolis on March 23rd through the 25th. 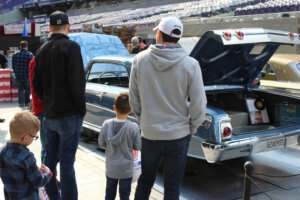 Twenty of these events are held annually and US Bank Stadium was the location on this weekend to check out over 200 hot rods and custom cars and trucks that were brought in from around the region. There was also an assortment of custom motorcycles and vendors selling vehicle-related items such as classic toy cars and vintage road signs. Day 1 kicked off on Friday and it was Student Career Day at World of Wheels. The program, which started back in 2006, helps to support school automotive educational programs by exposing students to the wide range of opportunities in the industry. 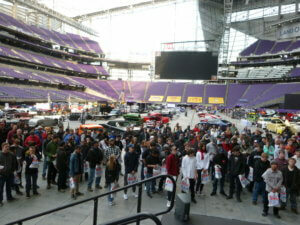 Over 300 students from Minnesota high school and college auto programs attended. This interactive experience allows students both at the high school and college level to participate in a positive and valuable hands-on experience. It also features guest speakers who share their experience, knowledge and passion for the industry, as well as offer insights on possible automotive career avenues open to students through their automotive studies. Following the general session, students were allowed to preview the show before it opened to the public. During this time, they were able to meet with the car owners and builders, participate in interactive exhibits and talk to representatives from MNCARS and other industry organizations about automotive careers, their programs and scholarship opportunities. Student Career Day allows students to venture out of the classroom and get a glimpse of where they can be headed in the future. Day 2 was on Saturday and the custom hot rods were on full display under the glass roof of the stadium. The crowds were large as different car care demonstrations were taking place and exhibitors booths were busy. The Celebrity Showcase kicked off with John Schneider, Bo from the Dukes of Hazzard, who was signing autographs and selling merchandise. Sunday was Day 3, and the final day of the event. The line was long and started filling up early for celebrity guest Dale Earnhardt Jr. He wasn’t to appear until noon, but the line snaked through the stadium almost right away that morning. This was the final day to examine the beautiful custom vehicles up close, watch as the owners worked on them and to ask questions about their fascinating history.